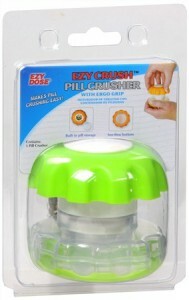 The newly designed pill crusher will make crushing pills easier than ever before. The ergo grips on both the top and bottom allow for more leverage and crushing power for people that may have weakness in the hands. The high density crushing pestle can handle even the hardest and largest pills. Comes with build in storage and a clear base so you can see pills being crushed.